The University of Maryland football team is known as the Terrapins. The Maryland Terrapins compete in the NCAA Division I FBS and joined the Big Ten Conference on July 1, 2014. The Maryland Terrapins football program was established in 1892. The Terps were NCAA Football National Champs in 1951 and 1953. The Maryland Terrapins play their home games in 54,000 seat Byrd Stadium in College Park. Official school colors are red, white, black, and gold, adopted from the Maryland State Flag. The official site of Maryland Terrapins athletics is UMTerps.com. The Maryland Terrapins head football coach is D.J. Durkin. The University of Maryland, also known as UMD, UMCP or Maryland, is a public research university located in the city of College Park, Maryland, just outside of Washington, D.C. The University of Maryland was founded in 1856 and has an enrollment of 36,000 students. Visit the University of Maryland online at UMD.edu. UMD Gameday Central has an outstanding collection of Maryland Terrapins football information featuring traffic tips and directions, Byrd Stadium parking info, University of Maryland gameday activities, and Maryland Terrapins football stadium information. The Maryland Terrapins home football stadium is Capital One Field at Byrd Stadium. The stadium opened in 1950 at a total cost of one million dollars. Byrd Stadium has since grown to an official capacity of 54,000. Maryland Fight Song and Maryland Victory Song are the official University of Maryland fight songs. View these fight songs and get free Maryland Terrapins ringtones at Maryland Terrapins fight song ringtones. Find University of Maryland wallpaper for cellphones and desktops, UM Terps screensavers and Maryland Terrapins layouts at Maryland Terrapins wallpaper and screensavers. Get the best prices on tickets to University of Maryland football games. You can comparison shop at one place online all the major sporting event ticket outlets at Big Ten Football Tickets. Big Ten Football Online has the cheapest prices on Maryland football tickets. Big Ten Football Online compiles all the local network listings so fans of Terps sports can listen to the University of Maryland football game online. Find out where you can listen to the Maryland football game online at Big Ten Football Radio Online. We have future Terps football schedules for the upcoming seasons. View the 2016 Big Ten Football Schedule Grid and the 2017 Big Ten Football Schedule Grid at Big Ten Football Online. Get access to all Big Ten football games, highlights, and replays on the Big Ten Network. 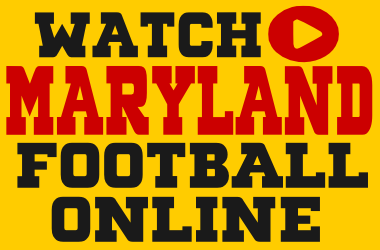 Find out where you can watch Maryland football online at Watch Big Ten Football Online. Big Ten Online is the best place to watch the Maryland football game online. The most popular message board forums for Maryland Terrapins Football are the Terrapin Times, Terp Talk, and the popular Turtle Sports Report forums. InsideMDSports.com…The independent Maryland sports site. TerpTalk.com…University of Maryland sports information show. Tracking the Terps…Terps news and commentary from the Baltimore Sun. Testudo Times…Living every day like it’s Stefonukkah since 2008. TerrapinTimes.com…Maryland Terrapins sports from Rivals. Turtle Sports Report…Maryland Terps Football updates from Scout. Terrapins Insider…UMD Terps sports news from the Washington Post. The Diamondback…The University of Maryland’s independent daily student newspaper. Terps Zone…Terps coverage from the Baltimore Sun. Terps TV…Live On Demand Video and Streaming Audio of Maryland Terrapins Football. WMUC Sports…Listen live online to the official student radio of the University of Maryland.